She may have been the last player into the field, but she sure didn't play like it. 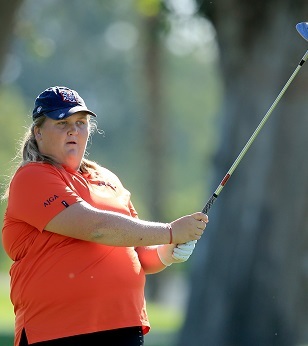 Haley Moore, 16 year old SCGA member from Escondido, Calif., came out of the gate on fire Thursday, collecting birdies on three of her first five holes to take an early lead at the ANA Inspiration, the LPGA's first major of the year. Haley, who found out less than 72 hours before she teed off that she'd be playing in the event, overcame a tough stretch on her back nine to finish the round at 1-over-par 73. Despite briefly holding a solo lead, she said she never looked up at the scoreboard. "I was nervous, so I didn't ever look," said Haley. "My hands were shaking a bit on the first tee box, but actually not as much as I thought they'd be. I was striking the ball really well and putting well to start so that helped me settle down a lot." Haley earned her way into the event by way of a win at the ANA Inspiration Champions Junior Challenge, an event run by SCGA Youth on Course. It was Haley's third time playing in the Junior Challenge, but her first win. "This week has already been incredible," said Haley. "Monday night I was lucky enough to be invited to the Champions Dinner, and that was so fun. I met so many nice people. I was really nervous, but the legends were coming up to me and were so nice to me they really made me have fun and enjoy the experience." Haley followed up Monday's Junior Challenge with a practice round on Tuesday before playing in the Pro-Am on Wednesday. Haley, a sophomore at San Pasqual High School who has already verbally committed to play her college golf at the University of Arizona, is quite familiar with the Dinah Shore Course at Mission Hills CC, where she won an AJGA event this summer. "I'm really comfortable with my driver, so this course suits me well," she said. After getting off to the blazing hot start Thursday, Haley ran into some trouble, dropping five shots in an eight-hole stretch. Showing the kind of mental toughness and resilience of a pro though, she bounced back quickly, ending a streak of three straight bogeys with a birdie on her 15th hole of the day. She would finish with three straight pars, including a seven foot par save on No. 9 (her 18th), and enter the clubhouse at 1-over-par, tied with names like Michelle Wie and Lexi Thompson. Thompson, who is the event's defending champion, sat at 1-over-par after Round 1 last year en route to her victory. "Hey, if she can do it so can I!" said Haley with a big smile when asked if she could win after shooting a 73. "I know I slowed down a bit for a stretch, really found myself in the rough a lot and the rough here is so hard to hit out of, but I'm happy I was able to bounce back and not blow up. I just knew there was a lot of golf left and anything could still happen." The day didn't end for Haley though after sinking her putt on No. 9 to end her day, as she was greeted by new fans, family, friends and media after coming out of the scorer's tent. Included in her gallery? Patricia Meunier-Lebouc (pictured with Haley), the 2003 ANA Inspiration winner and Haley's mentor from Monday's Junior Challenge, in which all participants are paired with a past ANA Champion. "She played great," said Meunier-Lebouc. "I was following behind a little and could hear the cheers. She really played wonderfully." For more on Haley's 2015 ANA Inspiration experience, click here. Awesome. What a great story.